As many of you know, my parents moved out to Colorado earlier this year. Chris and I visited them for the first time in November for Thanksgiving. This is actually my first Christmas ever that I’m spending without seeing my mom and dad, and it feels weird! My parents have always had a way of making Chrismas really happen whether you’re in the spirit for it yet or not. If I know them well enough, the house has been well-decorated all month long. The tree and decorations are up, lights are in the yard, and my dad probably gets a Christmas tune stuck in his head every day or so and hums or whistles it around the house. In contrast, my own house shows very few signs of the holidays. I just now put our little Charlie Brown tree up and that’s about it – I’ve just been too busy lately. But my mom still found her way of making sure the Christmas spirit is extended to us, even across all these miles. Yesterday we received a package in the mail with this adorable little ornament, so I’m feeling a little more Christmas-y now (I’m even inspired to get a real tree next year). And in honor of my dad, I’m humming some Christmas tunes around the house today. Love you both! 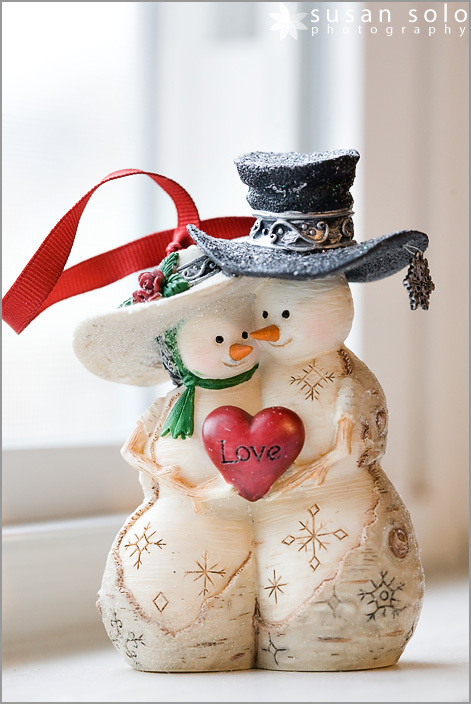 Jaci Clark - I love the snowman ornament. He’s so cute! We’ve been busy around here too and I haven’t gotten much decorating done either. Tomorrow, I’ll do it tomorrow. Better late than never, right?